www.1daytrack.com <- a new track every day! 1daytrack supports talent by giving them a chance to show their creations to a large amount of people. We select tracks on a daily basis and share what we like. 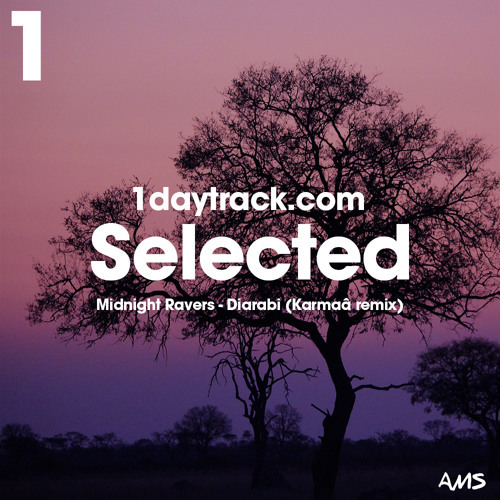 When we heard this remix of 'Diarabi' by @midnight-ravers we were over the moon! What a great vibe and depth this track has! French producer @karmaamusic and his label Jarring Effect did a great job here! What do you think? Free download: https://theartistunion.com/tracks/bddcc9 Do you think your song matches the 1daytrack style and should be posted here? Send us a message on submit@1daytrack.com --- Track by Midnight Ravers: https://www.facebook.com/pages/Midnight-Ravers/506985322663441 https://soundcloud.com/midnight-ravers https://www.youtube.com/watch?v=53uEPkUxvTM&feature=youtu.be Remix by Karmaâ: https://www.facebook.com/karmaamusic?fref=ts https://soundcloud.com/karmaamusic https://www.instagram.com/karmaa.music/ https://play.spotify.com/artist/3yx74xmlyOAsmyqn0r4iOV https://www.mixcloud.com/karmaa/ https://www.youtube.com/channel/UCYEDD9gc_wIbXlbjz7B2r8g?&ab_channel=Karma%C3%A2official --- http://www.1daytrack.com/ https://soundcloud.com/1daytrack http://www.facebook.com/1daytrack http://www.youtube.com/1daytrackmusic https://open.spotify.com/user/1daytrack.com http://www.instagram.com/1daytrack http://www.mixcloud.com/1daytrack --- Disclaimer All music posted on 1daytrack.com is for promotional purposes only. If you like the music, please support the artists by buying their music through Beatport, Juno, Whatpeopleplay, iTunes, Google Play, Amazon etc. Contact us in case of copyright issues. --- Do you like our activities? Help us to continue! Donate! PayPal: https://www.paypal.com/cgi-bin/webscr?cmd=_s-xclick&hosted_button_id=T5QJWYUSGNVZS Bitcoin: https://blockchain.info/nl/address/15m1Wb52pgNX4tv6ZANKXLLxK9MitsLBSF Thank you! Love the vibes. I particularly like the vocals.